As we enter the second full week of school here in Boston, I’ve had an Epiphany of late. I’ve thinking about what’s become my life’s work over the last 14 years now and that has been what I’ve called this blog many times “The Great Work” that is teaching the next generation of childen and young people. One thing I’ve learned over the years is you don’t need a Master’s Degree in Education to teach a student. You don’t even necessarily need to be a student. I have seen many different types of education models from my old school days to the present. I am by no means an expert but one thing I am good at it putting things in an easy to understand language. This is why I’ve decided to put my plans on an autobiography on hiatus indefinitely. I know that there were some who were legit looking forward to me finally writing and publishing a book about myself and to those folks, you have my apologies. My feelings on the current state of public education are much stronger than even my desire to write a book about myself. The book will be titled Public misEducation: The Struggle for Justice. The last 20 years in particular haven’t been very kind to Public Education in general. The way it’s portrayed in the media certainly didn’t help. The 1990s in particular were turbulent. No Child Left Behind brought a much-needed layer of accountability to our public school system. Despite this and a few parts of Brown v. Board of Education being overturned (happened in 2010 in case you didn’t know, more on this in a bit), the Achievement Gap is still far too wide for too many students nationwide. While some with the means (and some without) would either put their kids through private school or home school them, for the vast majority of our nation’s youth, public education is the only choice for American families. It’s for this reason they should be given the education they deserve, not just what we’re willing to pay for. I have spent the last 10 years amassing a wealth of knowledge on public education and dozens of different classroom, school and district models. The major thing left for me to do are interviews. Interviews with educators, students and families and non-profit organizations with a stake in public education. I expect this part of my research to take at least two years. The planned career change I have in mind will help with that–I feel it would be a conflict of interest for me to do some aspects of my research while still employed by BPS. Some of it has to do with equitiy and studeny privacy concerns while the rest are reasons I will share at a much later time to be decided. Asking about the book’s planned subject matter is fine. For example, parts of it may been perceived as an attack on the very foundation of the American Public Education system and deliverate shaming of our country’s refusal to hold itself accountable of its obligation to our nation’s students. The National Education Policy and what actually happens in classrooms nationwide are so far out of sync, unless you’re well-informed on the issue it’s really hard to figure out what the best course of action should be. Much of this is because of the language used and the invisible walls that separate familes, educators, schools, districts and policies. Does Public Education matter? Why is it relevant to me? When does a child’s learning truly begin? In Public misEducation, we will explore possible answers to these questions and others. As some of you are already aware, exactky two months ago I was hospitalized for Depression. I was at a point in my life where I could no longer keep the darkness around me at bay any longer. Not a day since then has gone by without the realization the person I was until July 2, 2014 died that day. The unseen scars inflicted on me over the years took their toll on that day. Not just because of how deep they are but because they were never allowed the chance to fully heal. I believe I said this in a You Tube video a few years ago but when you’ve been emotionally abused by your own family for as long as I have, what happened two months ago shouldn’t have been a surprise. I wasn’t surprised when they prettymuch pretended it never happened, either. It’s exactly what I expected to happen. And yes, I’ve gone through life expecting to be emotionally and verbally abused. It’s the one constant in my life that became harder to cope with in recent years. I have no support system and haven’t since I was in City Year. I tell every (City Year) alumni I’ve met over the years City Year saved my life. It not only did that but it helped me find an ideal to strive for. My tolerence level for anything stressful is virtually non-existant when it doesn’t involve kids. I will always have patience for kids. The way I was treated growing up is why there is nothing I will not do to help a child. This is one aspect that will never change. Yes, even to a fault. This might not surprise those who’ve read them but some of the more graphically detailed scenes in stories I’ve written over the years were written during the low points in my life. That is why I’ve often told folks “I write, therefore I am.” Reading my stories from Fanfiction.net and Fictionpress is a fairly accurate way to gauge my mood. I’ve never been good at hiding my true feelings so I don’t bother trying. When I’m feeling down it’s pretty obvious. In my case, it’s been more than I’ve let on. I told one of my coworkers last week “it’s when you’re down that you have to smile the most.” It’s been a a struggle for me over the last few weeks just to get out of bed. When I was in the hospital, one of my doctors told me I deserve to feel happy and enjoy the things I like to do. The reality is my right to the pursuit of happiness has been violated for so long it’s nothing but a myth to me. When school starts in two days, everyone will see for themselves I’m not the same person I was this time last year. The person I used to be wasn’t strong enough to do what needed to be done. I cared too much about making big mistakes and made big mistakes anyway. I got complacent and made the mistake of believing that would be overlooked. The person I am now…well, the price has already been paid. I’m not going to talk about what may or may not happen simply because I don’t know. I’ll let my school community judge for itself. As you can see, the adults have all aged well compared to the picture at the top. To those who were born after 1995, Full House was kept alive in reruns on Nick at Nite and TBS since the series finale in 1995. 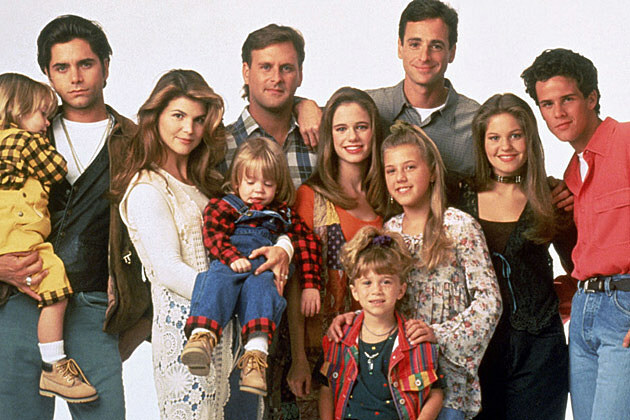 While the majority of the cast returned to private life after Full House, five of them continued their acting careers in the years since. Lori Laughlin and John Stamos found roles on other shows, Mary Kate and Ashley starred together in a string of sitcoms and kids shows (no doubt a nice change from sharing the role of Michelle on Fall House) and most famously (many of you might not have known this), Scott Weinger voiced Aladdin in the Disney films, tv show and video games. It would be awesome to see the show back. Hopefully it will catch on with the current generation. Gurl Meets World, which is the direct sequel to the 1990s hit Boy Meets World has the original cast from before but hasn’t been doing well in terms of ratings. On the other hand, Full House has a cult following spanning 25 years. They can do it. As for the approach, there’s a number of way it could be done. Assuming the Olsens are on board, I’ll be interested in seeing how they handle the character they shared as kids. Their hair now is not only different lengths but different colors and textures. The producers can go one of two routes: Have one or both girls wear a wig or introduce a new character who looks like Michelle Tanner. They have an opening to pull it off: On one episode of the original series, there was a family reunion and both girls were used. One played Michelle as usual while the other played her cousin and wore a black wig. The studio audience knew the twins took turns playing Michelle so in this way both girls would have airtime at the same time. As for the new storyline, I don’t think alot of imagination would be necessary. Here’s hoping it’s for real!